Once and for all, let’s understand wideband versus narrowband mag loops. It’s a case of open and closed, circuits that is. Okay, here goes. We will consider my 1 meter diameter aluminum loop. My loop can operate in two modes, open or short circuited. In open circuit mode, I leave a small space in the bottom of my loop, and connect a transmission line across this space. As a result, I will pick up a voltage induced in the loop by a passing magnetic wave. When you consider the equivalent electric circuit of a loop, things get more interesting. The equivalent circuit is a resistance and inductance in series, with a capacitance in parallel. The inductance is from the loop itself – a one meter diameter loop will have an inductance of around 2.5 μH, as well as stray inductance from the aluminum. Resistance is comprised of loss resistance from the wire, as well as radiation resistance and skin effect. Finally, you will notice that even an inductor produces stray capacitance, which is around 30 pF for my loop. So, even an open circuit un-tuned loop antenna has a resonant frequency from the loop inductance, wire inductance and capacitance. My loop resonates around 9 MHz all by itself. So, when I sweep a 1 μV signal across 500 kHz to 30 MHz range, the voltage at the terminals becomes very high at resonance, and very low everywhere else. For a tuned loop, you just add a tuning capacitor to adjust resonance, and feed the voltages into a high impedance amplifier. Voila, a very narrowband loop. So, how do you make a wideband loop instead? First, get rid of those pesky voltage terminals and short circuit the loop. Now the passing magnetic wave still produces a current. The great news is that this current is largely frequency independent. 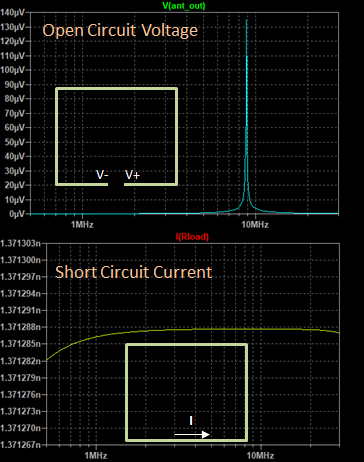 When shorted out, my 1 μV signal sweep produces a 1.37 nA current across most of the frequency range. My loop is now wideband. Second, though, I need to figure out how to pick off this current, which right now is stuck in the shorted loop. The answer is to stick a low impedance input amplifier into the loop itself. If I can find an amplifier with a very low input resistance (say 1 Ω) inserting it will not have much effect on the loop, but will provide access to the current. The answer is a current-to-voltage converter, or transimpedance amplifier. More on these later, and also an explanation of why a shorted loop becomes wideband. In the meantime, you now have a means to turn your loop current into a usable voltage.